Audiofly has recently introduced their AF1120. Audiofly has been providing great quality IEMs for several years now. And these Aussie's who have a knack for big bang for the buck products keep stepping up their game. And they appear to have done it again with the new AF1120's being a 6 driver design for only $699 MSRP. The Audiofly AF1120 came in a really nice color printed box, with photos of the IEM, and their specs. Materials used in the construction was mostly plastic, with some metal and cloth. Quality of materials used was very good, as was the fit and finish. You could tell they were a very well made product. And I loved the clear plastic housing, so you can see the drivers and crossover. The cloth covered cable is also a nice touch. Also included was a really nice cloth zippered carry case, multiple sized ear tips, airline adapter, wax tool, ¼ inch adapter and manual. Now it's time for Audiofly's AF1120 to show us how they sound. Twenty One Pilots: Heathens, percussion was very crisp, clean, and dynamic. Vocals are silky smooth, with very good texture. Keyboard sounded very natural with nice low level harmonics. Bass was very deep, full, and hit really hard with clean tight impact. Kansas: Carry On Wayward Son, vocals sounded very natural, silky smooth, with a lot of texture and resolution of the timbre. Keyboard sounded very natural with good harmonics. Percussion was crisp, clean, and very dynamic. Kick drum had very good low end extension, with great clean impact and authority. Soundstage was big and imaging was spot on. Fresh Aire: Going To Another Place, strings were very crisp and clean with very good resolution. Kick drum was very tight, clean, yet very full with good depth and authority. Flute was very smooth with good air, and with enough resolution to make out the tonguing technique. Piano sounded very natural with nice harmonics. The Audiofly AF1120 at it's $699 price point, is truly aimed at the audiophile on a budget. In fact Audiofly is gaining the reputation of being an audiophile on a budget type of company. You get a great bang for your buck as you work your way up their product line. You get great sound for you money on their entry level models, and it gets even better as you work your way up their product line. And the Audiofly AF1120 is no exception. An in ear monitor with 6 balanced armatures and 3 way passive crossover for only $699 is killer! Oh...and so is the sound! Audiophiles on a budget...stop salivating. Just take the plunge. 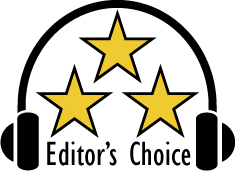 Based on it's design, features, quality, and performance, the Audiofly AF1120 has earned our Editor's Choice award. For more info and complete specs, check out their website at www.audiofly.com.